Happy National Day Singapore! Happy Golden Jubilee! Happy SG50! I have fond memories of the laksa my mom used to make, Peranakan style! No chicken, cockles of fried bean curd. 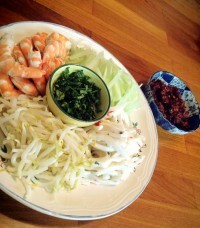 A powerful home-made rempah (spice chilli paste), a proper prawn stock and well cut condiments are key. Dad’s friends would be over for a laksa party, I remember the taste…so well rounded. Happy delicious memories in our household. A blessed National Day to my countrymen. Let’s not forget how we got here.